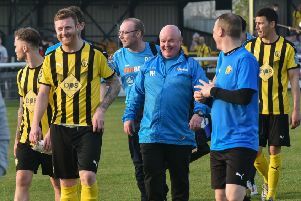 Brakes’ abundance of quality in the attacking third eventually told as they continued their rich vein of goalscoring form at home to King’s Lynn on Tuesday evening, writes Paul Okey. Two goals in the final ten minutes finally killed off the challenge of their East Anglian rivals, with Courtney Baker-Richardson and substitute Jack Edwards adding the gloss. However, the three points rarely looked in danger once Ahmed Obeng had capped a mercurial performance with the 57th-minute opener. The second-half salvo went a long way to erasing the memory of a tepid first half, which only occasionally threatened to flicker into life. Richard Taundry sent a free-kick from 25 yards past the post with the aid of a slight deflection, while Thompson-Brown dragged a shot wide after a pinpoint clearance from Breeden released him on the left flank. However, it was Obeng who was at the heart of Brakes’ most promising moments, with his pace and close control causing panic among the visitors’ retreating ranks. A cross from the left was palmed out into the danger area by Town keeper Alex Street and after the visitors had only half-cleared, Obeng was crudely chopped down inches outside the box by Ryan Fryatt to earn the midfielder a booking. The resultant free-kick from Thompson-Brown shaped well but was just too high. Obeng was again sent tumbling seconds later, with Fryatt one of two Town players involved in the challenge, but the referee chose not to issue a card on this occasion. Connor Gudger looked to replicate some of Obeng’s trickery on the edge of the box, but after earning himself some space to get a shot away, he put his measured effort too close to Street. The visitors had their first shot of note in the 38th minute, with Kurtis Revan laying the ball back for Sam Gaughan, but the defender’s hurried effort was always going wide despite touching a defender on the way out. After little in the way of goalmouth action in the first period, both defences seemed intent on giving their opposing forwards a helping hand when the second half got under way. Two sloppy mistakes in a matter of seconds presented Leamington with possession in dangerous positions, but Ryan Rowe’s final ball was under-hit, while Darren Pond’s shot from the second opportunity was easy for Street. The home defence were equally culpable when Revan was allowed to skip past a challenge on the right wing and send in a dangerous cross to the unmarked Jacek Zielonka at the far post. However, with the net gaping, the striker somehow manager to divert his shot across the face of goal and Brakes were able to clear the ball for a corner. As if stung by their close shave, Leamington upped the tempo and opened the scoring just short of the hour-mark. Thompson-Brown’s trickery on the edge of the box was eventually ended by a foul but referee Richard Gardner played advantage as the ball broke to Obeng and he sidestepped a challenge before rifling the ball into the net and nearly taking Street with it. More quick feet on the edge of the box from Thompson-Brown earned him a shooting chance a minute later, but his connection failed to match the approach play and the ball was skewed harmlessly wide. The Linnets were now afraid to put in challenges as Brakes’ frontmen attacked at pace and Obeng was denied what would have been a quite wonderful second after slaloming through the heart of the Town defence, Street smothering his eventual shot. King’s Lynn made two attacking substitutions to try and force their way back into the game but it was Brakes who scored the evening’s crucial second goal. Gudger deserves the plaudits for a lung-busting run down the wing, with the left-back coming through a challenge on the byeline before getting the ball to Rowe. He in turn helped it on to Baker-Richardson whose shot on the turn went in off the underside of the bar. And then as if to prove his goal against Dorchester was no fluke, Edwards made it 3-0 with his first touch after coming on, guiding the ball into an empty net from way out on the left touchline after Baker-Richardson had been denied by Street on the edge of the Linnets box. Brakes: Tony Breeden, Richard Taundry, Connor Gudger, Darren Pond, Jamie Hood, James Mace, Courtney Baker-Richardson, Joe Magunda (Tom James, 88), Ryan Rowe (Jack Edwards, 85), Rob Thompson-Brown (Ryan Quinn, 90), Ahmed Obeng. Subs not used: Ben George, Martyn Naylor. King’s Lynn: Alex Street, Danny Emmington, Jordan Young, Sam Gaughran, Gary Mills (Lee Stevenson, 78), Ryan Fryatt (Dylan Edge, 83), Michael Clunan, Dan Quigley, Jacek Zielonka, Leon Mettam, Kurtis Revan. Subs not used: Eoin McQuaid, Toby Hillayrd, Luke Pearson.